“You have got to try this Pizza”, that’s what we say to everybody who hasn’t yet had the pleasure of tasting the unique crunch of Pizza King Pizza in South Bend, Indiana. There’s a lot of good pizza out there, but there is just something different about the way this pizza is made. Maybe its the loads of cheese, or the corn-meal crust, or the strong sausage or pepperoni flavors? 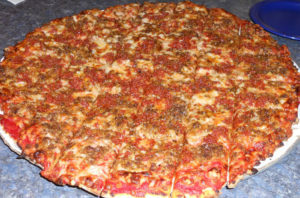 I don’t know, but it is a taste that you will crave every time you think about your Pizza King South Bend experience. The best thing to do is come in and give it a try and see what you think – we are confident that you will keep coming back for more. Then after you’ve satified your taste buds with the savory taste of Pizza King Pizza, tell a friend to check us out, they will thank you.